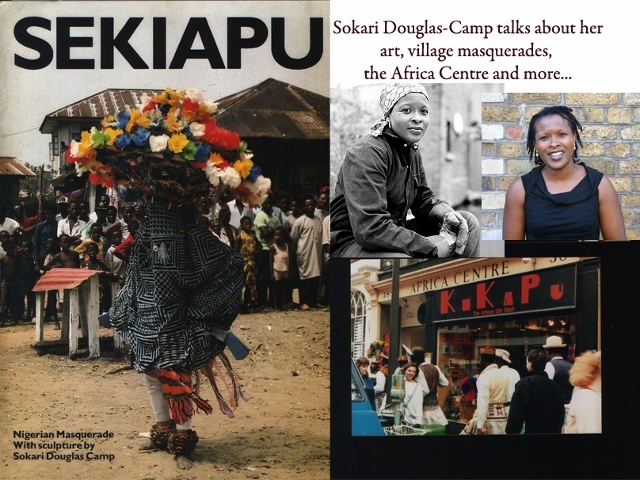 Sokari Douglas-Camp is one of the UK’s foremost sculptors of African descent. She was the first Artist-in-Residence at London’s Africa Centre in Covent Garden. The residency was an experience that helped launch her career internationally. She recently spoke to Dele Meiji Fatunla from the Save The African Centre (STAC) Campaign about the Africa Centre – and what it meant to her. Thank you for speaking to me today, really what I’d like to ask you about is about your time at the Africa Centre and how you came to be involved with it? The Africa Centre was my first exhibiting space; I went in and chatted to the arts and culture person there [Tony Humphries] and I said was going to Central [St Martins] and I needed to show my work to people other than my English tutors because they really didn’t have any idea what I was trying to make with my art and I need to have a conversation with other Africans if possible, and so I did a four-day exhibition at the Africa Centre, and it was very bizarre because I was only in my second year at Central, and then after I got my degree and my Masters, I became the first Artist in residence at the Africa Centre in 1987. So you literally just walked off the street and into the Africa Centre, so you must have known about it…were there any other places that you thought might have been responsive to your work? What was the environment like at the time when you went there? How did your four day exhibition go? It taught me a lot. It taught me how to catch press – Time Out [Magazine] had offices nearby and I just used to go and sit waiting for Sarah Kent (the arts critic at Time Out then) to go to her desk. I sat and waited. I was given lists of people from the Africa Centre that were interested in art, and I established a list from being involved with the Africa Centre; and the arts person there (Tony Humphries) taught me how to write letters asking for grants and all sorts of things. Was there quite proactive support for African Artists at the time? So Greater London Council or whatever they were called, had the idea that things had to be ghettoised, actually; and it was people at the Africa Centre, that I think gave me the guts to say to Greater London Arts, that things didn’t have to be ghettoised, we were members of the community and the community was broad and central, and we could show anywhere we wanted and it didn’t have to be Brixton anytime an African wanted to do something and the Africa Centre established that then, and I think in 2011 it’s still needed just because its central. How did your becoming an artist-in-residence develop from your four day exhibition? What Happened? I don’t know, I guess I got some fans, people who wanted to encourage me to continue as an artist, and after you’ve been in education for a long time like I was I needed a little support and the Africa Centre came up with this idea for this residency. When was your four day exhibition? Did your profile increase during that time…I guess what I’m trying to figure? What was the impact of your four day exhibition and the residency of the Africa Centre on your Career? So that’s international reach and power...from the Africa Centre! You are one of the pre-eminent artists in the UK, especially of Artists of African Descent in the UK? My question is do you think the Africa Centre made that kind of achievement easier..do you think the African Current of the Africa Centre have any impact on your art? Your going to Royal Festival Hall? Oh no, no, no, the Fela performance that happened at the festival hall; I did show at the Royal Festival Hall. I showed there because some curator liked my work. And was this post the Africa Centre? Yes. Everything was post the Africa Centre. It sounds like the Africa Centre was your launchpad? It was. And the people who took notice of your work at the Africa Centre, was that the wider audience in the UK or was that primarily, I mean you’ve mentioned the Smithsonian...I mean was the audience purely African? No it was international, and it was international because I think there was an exhibition called ‘The Magicians of Africa or something, and it was an exhibition that happened in Paris and it showed African art and compared it to European art and just showed that African Art had influence European Art and there were these contemporary artists like Sheri Samba that were doing perfectly valid work but from an African line and they were called the magicians’ of something or other, I can’t remember and I was in the wave of that conversation – and it was the time. It was. It was absolutely necessary. The Africa Centre, What can I say about it? The Africa Centre was like a shrine, and it gave one license for one’s identity; was so important, what can I say about it? I can’t be too intellectual enough about it...except for my exhibition for my show, Sekiapu the Africa Centre was used as a shrine and I have sculptural things in there that were kinetic, the guys performed in there, the governor of rivers state came to the Africa Centre, we had Nigerian food in the restaurant, and you know for the time it focused on Nigeria for the time that the exhibition was on; it just made me feel better as an individual, as a person more valid, at least we were so at sea, in England because you have to have an awful lot that makes you worthy in someone else’s land – and the Africa Centre was it. Moving to the future, what would you say to people who say that was then and it was a much more embattled environment for black people and Africans and what would you say about the Africa Centre and its necessity, and the necessity of somewhere like it, I suppose..In the current disposition? The current position we’re in; I’m just so sorry that this has happened to the Africa Centre but you know it’s bad management, as far as necessity; it’s needed because we have so many different opinions of what an African is, and you know there’s Diaspora children as well who have this heritage you know, so it’s terribly important that the Africa Centre exists because you know in there slaves were sold and Ben Okri was there anxious about how he could make a career out of writing and you know it’s got an awful lot of heritage for an awful lot of people. Did you come in touch with these different people at the Africa Centre? I did, heard political arguments that you knew nothing about, but you listened and if you could put anything in, with a beer in your hand you shouted your piece. I mean yes, I did come across all these characters there, so you know the kids of today, people that have black heritage need an Africa Centre so that they realize that there’s so many different people in Africa. Especially with all this revolutionary things going we need to just go in there and take it over. I guess you know about the current plans by the trustees of the Africa Centre to lease the building for 125 years and that there are no specifics on what’s going to happen with the new plans for it? Obviously I’m interviewing you on behalf of the STAC Campaign. And you’re a signatory to the original letter, why? Because my career wouldn’t be without the Africa Centre; and it could do the same for another person who needs that kind of space who just needs that kind of identity to make their mark in their career or life, so it’s needed. And I think that’s a great note to end on. I was shy and I’m still a bit shy and the Africa Centre was a place with clout, the whole of Africa, the whole continent behind my backs to fall back into; and actually I’ve always been uncomfortable being termed only an African rather than as a person but with the Africa Centre where it is, and the status of Africa in the world, you know, one of the biggest continents or landmasses in the world, I don’t mind being part of that. The Africa Centre was important, you want to do your profession, and be recognised for your profession instead of being recognized as... (The African Artist) I mean in Nigeria you have over 300 languages and if you make a little children’s about Eze goes to school, you have to do Ayo goes to school as well; some Hausa name as well, and you just think Africa Centre, what are they talking about? I’ve had conversations with people who say ‘I have a problem with this whole Africa Centre idea but then at the same time...its good place, because the identities are so contested, you know this is where we are going to talk about it? Yea, it’s needed more than ever now. Because who else can talk about it? Dele Meiji is a London-based writer and researcher.